One of the most common questions I get as a brand strategist is whether a B2B brand should be on social media. There is a common misconception that social media only benefits consumer brands. The truth is … social media can equally benefit both consumer and business-to-business brands if a clearly thought out and well written social media strategy is in place. 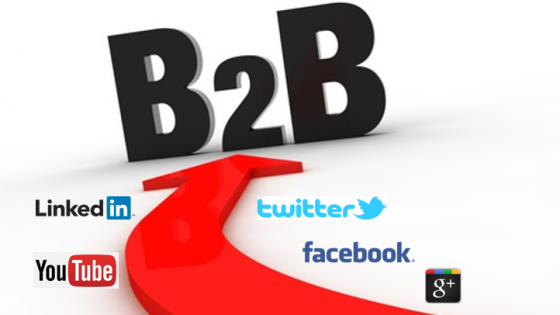 There are at least five solid strategic reasons why B2B companies should be on social media. The single most important benefit of social media for B2B marketers is the opportunity to increase awareness of your brand. Consider the following awareness-to-loyalty continuum. Without awareness, a prospect doesn’t even know you exist, so how could they consider purchasing you? Social media is a cost-effective means to increase awareness among individuals you believe are your core prospects. As a B2B business, you are not reaching out to the 321 million people that live in the United States … a feat that a consumer brand may have to realistically consider. Instead, you are reaching out to a finite group of individuals. 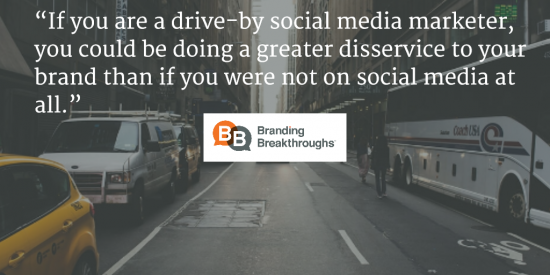 The key is to discover which social media channels your prospective target is frequenting. Gone are the days when the number of followers you have on social media is the lynch pin to success. If you have 500 followers but they are exactly the type of individuals you are trying to connect with, that lower number of followers may be a virtual goldmine. Each channel serves a purpose and, therefore, should be selected on the basis of your specific needs. Many articles talk about the big three for B2B: LinkedIn, Twitter and Facebook. While these channels may represent a good starting point, they may not be the most appropriate channels for your business. LinkedIn provides a perfect forum to connect with other like-minded individuals in your industry. Join a special interest group to talk about industry trends, ask customers to endorse your brand or to write a recommendation, publish original content to establish your company as a thought leader or find young professionals who share your company’s passion to hire for that open position. Twitter is a terrific channel to establish thought leadership by using industry hashtags or a special hashtag you have created to showcase something specific to your company. It is also a great way to remain plugged in to industry news and happenings. Follow industry leaders to understand which issues and topics are top-of-mind and tweet relevant and important topics to individuals that will begin to turn to you for advice. Facebook is a good forum to showcase your corporate culture, engage with customers on a personal level and show a little bit of the fun side of your personality. YouTube is a perfect platform for brand storytelling or how-to videos that help your brand come alive. While the jury may still be out on the overall effectiveness of Google+ as a networking forum, there is one thing that is irrefutably true – it elevates your brand in Google search, providing an easier way for current and prospective customers to find you. If you work on a particularly visual brand, perhaps Instagram or Pinterest will provide you the perfect forum to connect with others looking for infographics, how-to pictures or suggestions on how to use your brand in unexpected ways. How do you stand out from your competitors? As President Mike Crawford of marketing firm M/C/C points out, “As a B2B business using social media, your goal is to position the company as an industry leader.” If you have a blog on your website and are struggling to get people to read it, social media provides a forum to broadcast your content. So much of what is shared on social media is regurgitated information, so original content can really break through the clutter and establish your brand as a thought leader, helping to build credibility and trust in your overall brand. But, the most convincing reason to use social media as a B2B company is that, plainly and simply, it works. Research conducted by the Content Marketing Institute shares a number of very impactful statistics. Over four-in-five B2B marketers (86%) use content marketing to reach their targets and social media is a prime way to distribute that content. Over half of B2B marketers use five social media platforms – LinkedIn (91%), Twitter (88%), Facebook (84%), YouTube (72%) and Google+ (64%) and usage of all these channels is on the rise. While there is certainly room to optimize their usage of social media, B2B marketers believe that LinkedIn (63%), Twitter (55%) and YouTube (48%) have proven to be effective for their businesses. Throughout this process, please keep in mind that building a loyal social media following takes time. Services that offer you thousands of followers for a small price merely populate your follower count with individuals that are not your core target. Evaluate. Plan. Provide adequate resources. Take the time to execute properly. You will not regret it.